Place the popcorn on a baking dish covered in parchment paper. Chop the chocolate into 1-ounce pieces. Place in a container in the microwave for 30 seconds. Stir. Continue melting and stir in intervals of 20 seconds until completely melted. Stir the pastry mixture in with the melted white chocolate and melted butter. Sprinkle the mixture over the surface of the popcorn. Use the spatula or your hands to cover the popcorn evenly. Cover in sprinkles. Let sit for 2 minutes before eating. You can also use chocolate sprinkles. Popcorn is a part of nearly everyone’s childhood. This recipe can be prepared in the blink of an eye and is welcomed by children and adults alike. 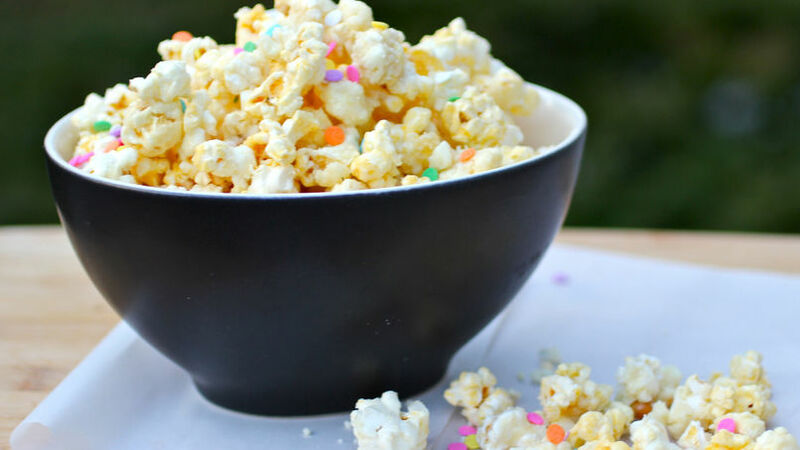 Classic popcorn is quickly turned into a sweet and crunchy dessert when covered in white chocolate, cake mix and colorful sprinkles. The combination of sweet and salty is amazing. If you’ve never tried this mix, then I definitely recommend it. This birthday cake flavored popcorn is perfect for any children’s party.